Home / Articles / 2009 / 2009 Manufacturing Trends Survey: Economy Ahead, Proceed with Caution! 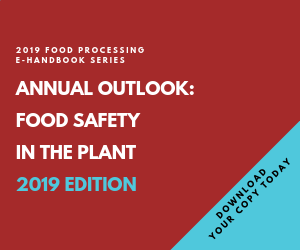 Last year at this time, nearly 77 percent of food and beverage processors who answered our 2008 Annual Manufacturing Trends Survey anticipated an increase in production of at least 5 percent in 2008. With the economy in the Port-a-Potty, processors this year are singing a different tune. Even dropping the minimum projected production increase to 3 percent brought those looking up in 2009 to only 56 percent. On the other hand, 43 percent of respondents say they’re optimistic going into the new year; only 22 percent are pessimistic. For the eighth year, our statistical analysis generates a picture of processor concerns for the year just getting under way. Based on a ranking scale assigning weighted relevance to each of nine categories (see figure 1), each concern was assigned points to determine level of importance. Food safety, as usual, was No. 1, as it has been every year of our survey. Energy issues, for the second year in a row, are second, perhaps a little closer than last year (although our methodology changed). And labor issues again are third (energy and labor have jockeyed between second and third since 2006). Two hot buttons of the past year – sourcing and materials and environmental concerns – picked up a few more votes this year, but not enough to move them up the charts. However, the cost of ingredients and commodities, which we thought we had covered in “sourcing and materials,” received the most write-in votes. And the economic downturn has not slowed the emphasis on “green” initiatives. Sixty-two percent say sustainability efforts are becoming more important; 18 percent said less important. Food safety marks its eighth straight year positioned as the top concern of processors. And for good reason: The past two years’ worth of food safety issues added intentional contamination of ingredients (from China) to the usual list of unforeseeable pathogen infections, undeclared allergens and animal and plant diseases. As in previous years, processors still “get it,” that the key to better food safety and sanitation lies in employee training. In fact, the 84 percent of processors focusing on training is not that much lower than 2008’s 89 percent. HACCP plans, too, held up with 51 percent vs. 57 percent last year (see figure 2). Pest control was the interesting change: Last year, 51 percent of processors said they’d bolster food safety by going after critters. But this time that number dropped to 38 percent. This year’s results track very closely with last year’s on concern about E. coli and other pathogens, outside audits and track and trace systems. Despite no backtracking on food safety, the economy is the elephant in the room for this year’s survey. Not a part of our annual list of nine core concerns (we’ll add it next year), it’s the word on every processor’s lips. When asked “How has the economy affected your plant?” exactly half said “not much.” But that means another half said reduced production (42 percent), layoffs (23 percent) and “closing of this or other locations” (6 percent). “Cash flow is a major challenge,” notes Mark Miller, plant manager for an eastern mushroom products company. “We need to get paid [from customers] so we can pay our vendors. Already we’re seeing some evidence of slow pay turnaround, and I believe the worst is yet to come. When asked “How is your company dealing with the economy?” 40 percent see no great changes, and 27 percent actually report they’re growing. But 31 percent are seeing layoffs and others report salary cuts, consolidation and outsourcing (figure 3). What does all this mean for expansion (or consolidation) of businesses in the coming annum? While more than half foresee some production increases in 2009 and 30 percent see it staying the same, 13 percent anticipate a drop in production where only a handful (3 percent) did last year (figure 4). Last year at this time, all but 11 processors polled answered that they were “very” or “somewhat” concerned by the cost of energy — and that was before the big jump in oil costs in mid-2008. All but a couple dozen had been “moderately” or “severely” impacted by a rise in energy costs in 2007, with 55 percent finding the energy cost increases to be more than they anticipated. Numbers were similar this year, with 86 percent “moderately” or “severely” impacted and those finding energy cost increases to be more than they anticipated rising to 61 percent. The steps processors are taking to manage energy costs are nearly identical to answers last year, including energy conservation (68 percent), energy audits (35 percent) and recycling/redirecting (23 percent). Multiple answers were allowed. Nearly 19 percent are looking at alternate energy sources. The early-2008 run-up in oil prices drove home how integral the price of energy is to nearly every facet of this business — not just to running the plant. While the recent, dramatic drop in oil prices is welcome news to all, apparently food and beverage processors are not seeing all the benefits they expect. Energy, of course, brings us to the environment. This year, we didn’t beat around the carbon-absorbing bush: “Given the state of the economy, how important are your company or plant's ‘green’ initiatives for 2009?” we asked. And 62 percent of you said green initiatives are becoming more important than they were in 2008. We assumed economic constraints would weaken processors’ reserve, especially at the plant, but “only” 18 percent said the issue was less important. However, more than two-thirds say their companies are not planning to implement any sort of alternate energy sourcing (solar, wind, biodiesel) for their facility in 2009. All is not lost on the green front, however. The main area where processors are putting their money where their mouths are is solar power. Other strategies written in include: conservation, wind power and biofuels (biodiesel, waste burning, methane etc.). The only significant non-energy initiative companies are using to make their facilities more green is recycling. A few respondents wrote in new lighting, eliminating or reducing packaging and even elimination of paper communications. 16 tons and whaddaya get? Labor technically held down third place, although sourcing & materials got a few more first-place votes. Labor saw a change in focus compared to previous years. Immigration worries abounded at the end of 2007, and finding and keeping good workers was paramount the year before. While those two remain concerns, this year the biggest labor issue is layoffs. On the positive side, more than half — 52 percent — say they plan to maintain their current workforce through 2009, and one in six actually plans to increase staff . Twenty-one percent anticipate workforce reductions, either actively (8 percent) or passively (i.e., through attrition — 14 percent – and we did some rounding here). A snapshot of two job categories opens a narrow window on workforce trends. When asked to compare staffing levels now with those of three years ago for both engineering and R&D, “about the same” was the prevalent answer. But among those noting changes, engineering appears to be on the slide and R&D on the upswing. Sixteen percent see a reduction in engineering staffing while 14 percent report it growing. But in R&D, 20 percent see growth while only 14 percent see a decrease. Perhaps the most surprising item in our labor picture is the 36 percent of companies planning to give pay raises next year. Although down slightly from last year’s 42 percent, fewer (9 percent) say they will decrease salaries, as opposed to last year’s 13 percent who did.